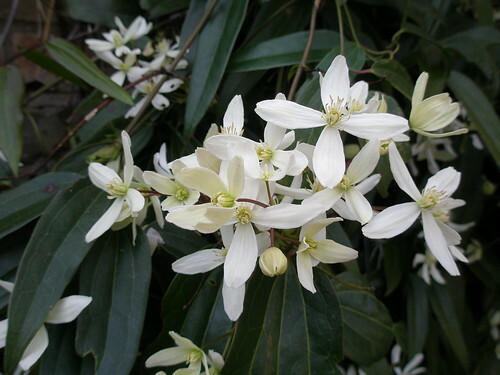 The clematis in the back garden is looking lovely today. I didn’t find it that inspiring a collection. Maybe I’ve been spoiled by too much good wine from Majestic (thanks Michael! 🙂 ) or maybe I wasn’t in the mood last night. The sherry was great, but I know La Gitana well. The Pinot Gris was lovely and well made, and was the most enjoyable wine of the evening for me. I didn’t like the metallic semillon from Australia, too acidic and the mineral nature was too strong and reminded me of CFCs out the back of a broken fridge. The two expensive wines were good, but at half the price! The portugese wine was good value as a glugger, and at £11 a bottle I would have been happy with the desert wine. I actually bought a bottle of New Zealand Pinot Noir on my way out (well it was pay day!) and I hope this will be good because I hadn’t tasted it! Amongst other things, we learned from Edward was that La Gitana is made ‘en flor’, which means that the wine is fermented open to the air and that a cap of natural yeast floats on the wine and helps reduce oxidation. The Bourgogne was a much better qaulity wine that the labeling might suggest—this is because the producers in Burgundy can only put forward a certain percentage of their beast grapes for the top quality wines and even if they have loads of great grapes, these have to go into a lower classification. Bourgogne is the lowest classification but the qaulity of this wine was better than it could have been (and thus £23 a bottle). I wasn’t convinced about the value for money! We also learned that the Pinot Gris, a medium wine, went really well with salami. 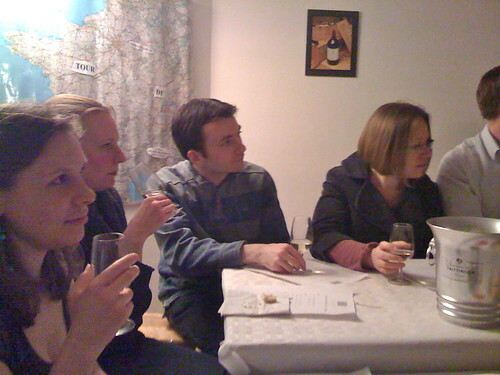 The food tasting went well, and we had olives to match with the sherry (good), pate, tomatoes and cheese. Jay and I went to see The Lady in the Van, by Alan Bennett, produced by BAWDS at the ADC. It’s a great play, full of dry humour. We weren’t sure what to expect from an amateur production, but the three main leads were all excellent: Particularly the actor who played the older Alan Bennett (Barry Brown) and the actress that played Miss Shepherd (Rosemary Eason). Had a couple of pints of Sparta which was lovely and when we left at the end Michael was sitting in the perfect seat, drinking a half of Sparta, waiting to meet us! The Lady In The Van is an autobiographical account of an episode in acclaimed playwright Alan Bennett’s life in 1974. Elderly and eccentric Miss Mary Shepherd is living in a decrepit van in a street near the author’s home in Camden Town. Allowing her to park her van in his front garden for three months, she ends up staying fifteen years. The outrageous Miss Shepherd, a trained concert pianist, ex-nun, ex-ambulance driver and would-be Prime Minister, forces her benefactor to turn down the volume of his radiogram, recharge her van’s flat battery and become her reluctant carer. The play offers two Alan Bennetts; one at the age of the portrayed events and an older, more sceptical individual, who is able to take a retrospective view to discuss with himself (the other Alan Bennett) the philosophical issues and true reasons for his kindness to Miss Shepherd. It may all sound complicated but it quickly becomes clear to provide a deliciously comic theatrical evening! In Google Street View: must have been a rare moment that the car passed by. I was hoping to spot a few familiar faces at the bar. Michael and I drove over to Bicester take Michael’s mum out for lunch at Bicester Country Club. We had a good lunch in Gray’s Restaurant, good food with somewhat lackluster service. I don’t think they were quite prepared for being full on Mothers’ Day.